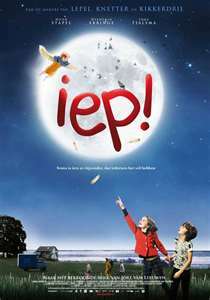 Eep is the sound a bird-girl makes. 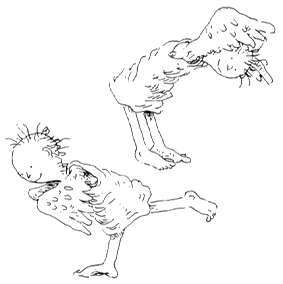 Specifically, a girl named Beedy, a girl with wings instead of arms that Warren, a bird watcher, finds under a bush one day. He takes her home, and with his wife Tina feeds her, clothes her, teaches her how to drink soup using a spoon (between her toes, not quite suitable for dining out). Beedy loves peanut butter. Or as she calls it, “peeneet beettee” (she can’t quite pronounce ‘u’). While Beedy may look like a girl (if you hide her arms in a cape like they do) her true nature is to fly, to be outdoors and in the sky, and to feed on insects (and the occasional peanut butter sandwich) and so she takes off, and Tina and Warren go off in search of her, meeting new and interesting people along the way. A fun quirky little book with quite darling illustrations. 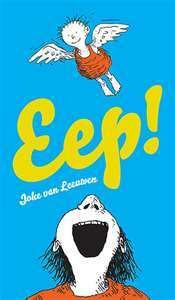 Writer and illustrator Joke van Leeuwen has also written other interesting-sounding children’s books. 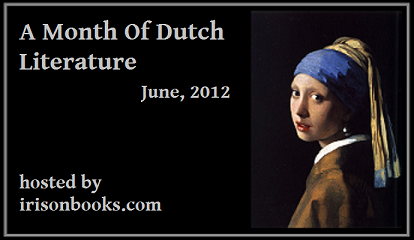 I read this for Dutch Lit Month and via an e-copy from Netgalley. I very much enjoyed this book. It’s so quirky and yet it wasn’t only fun but also meaningful to me. I hope to pick up a copy for wee reader one day. I’m sure he’ll enjoy it too.